If you love bacon, raise your hand. I’m raising both hands right now with three pieces of bacon in each hand. 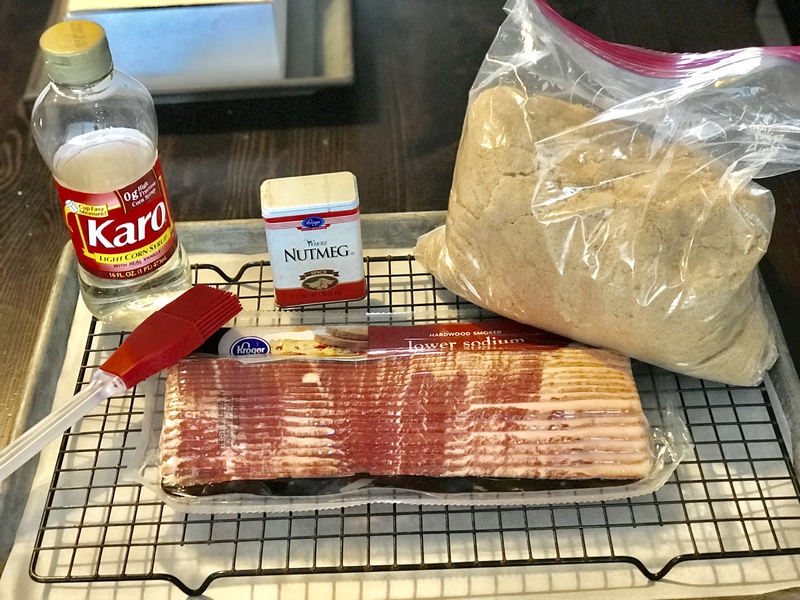 Bacon is magic and we all know how to use it for Bacon Lettuce and Tomato sandwiches or sprinkle some on a salad to make the lettuce bearable. 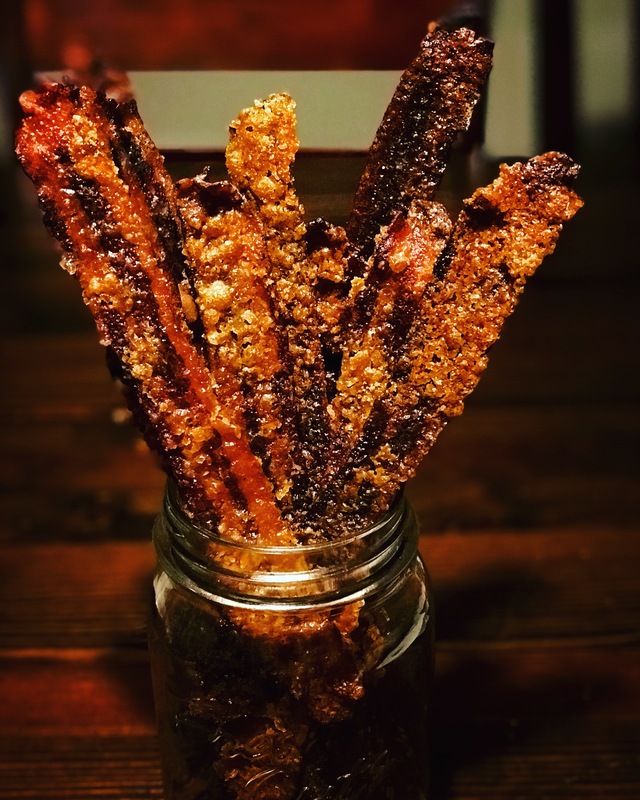 But how many of you have actually used bacon as a dessert or treat? 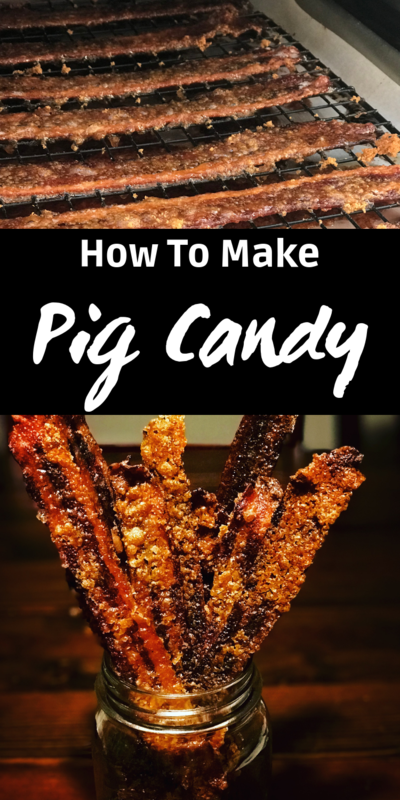 That’s where this recipe comes in and you and your friends and family will have your eyes opened to the wonder that is Pig Candy. This is a pretty simple recipe but don’t be fooled by it. Taking your time and doing it right will make all the difference in how it turns out and how much you enjoy it. The wonderful thing about this recipe is that there is no specific amount of any ingredient so it’s super easy to go all out. 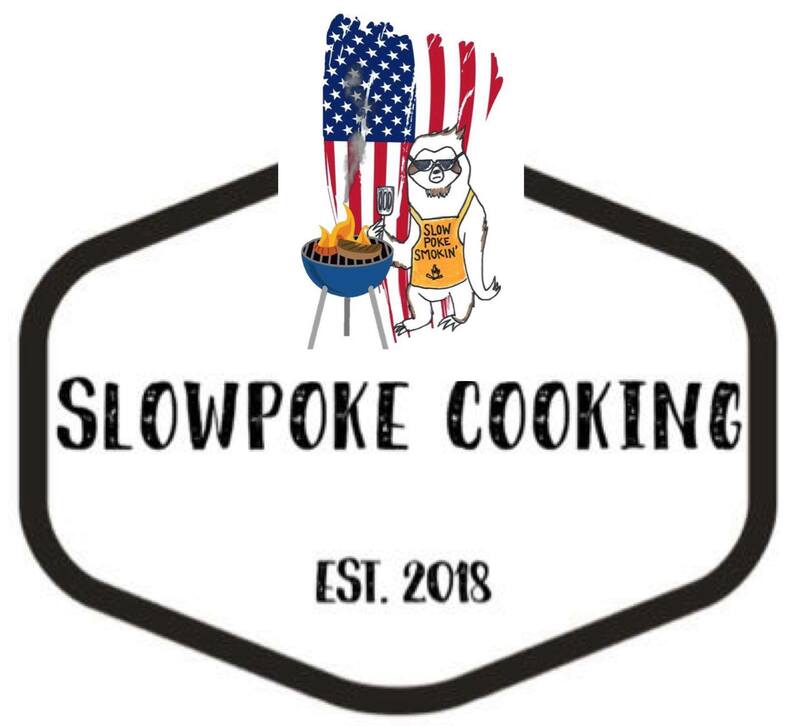 Preheat your smoker or oven to 350 degrees F.
First place a piece of parchment paper on a cookie sheet then a cooling rack on top of that. Lay out each piece of bacon with some space in between each piece. This set up will allow for airflow and help to make your bacon crispy. Next, brush each piece of bacon liberally with Karo syrup or maple syrup. This is the glue! Then cover your bacon with brown sugar. Don’t be stingy with that brown sugar. The more you put on, the more you’ll thank me later when I tell you a surprise about this recipe. Finally, grate a healthy amount of fresh nutmeg or sprinkle some chili powder onto your brown sugar covered bacon. This isn’t a necessary step but gives a little depth of flavor to the bacon. 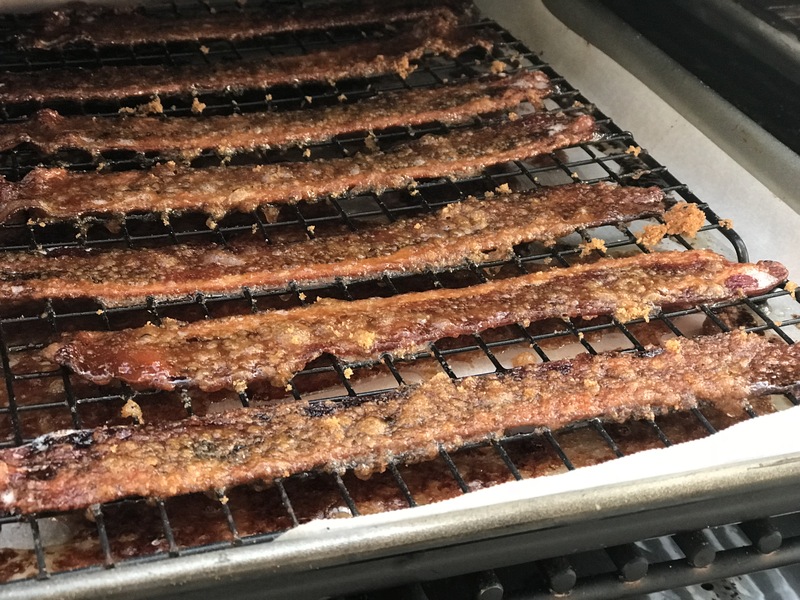 Place your trays of bacon in your 350 degree F preheated smoker or oven. 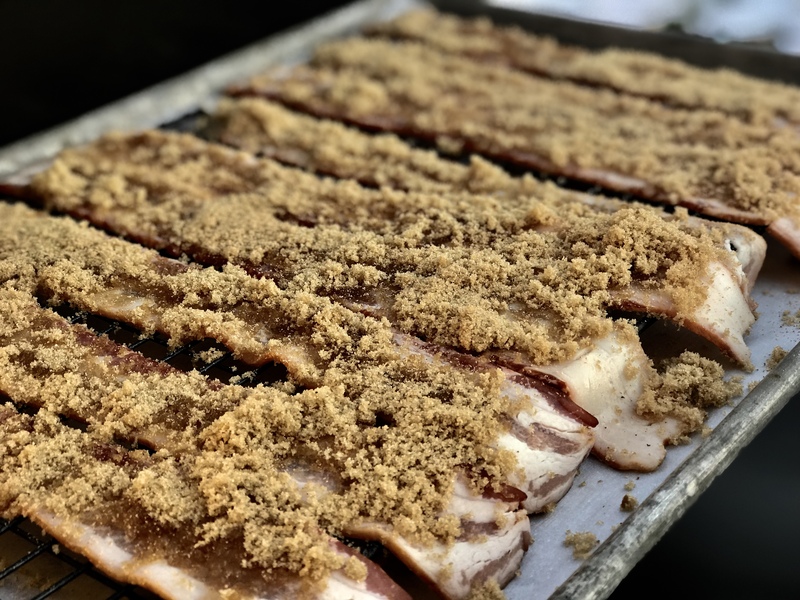 Cook time will vary based on which appliance you’re using but your bacon will need at least 30 minutes to absorb the brown sugar and crisp up. So once your bacon is crispy, pull it from the smoker or oven and let it cool for about 5-10 minutes. 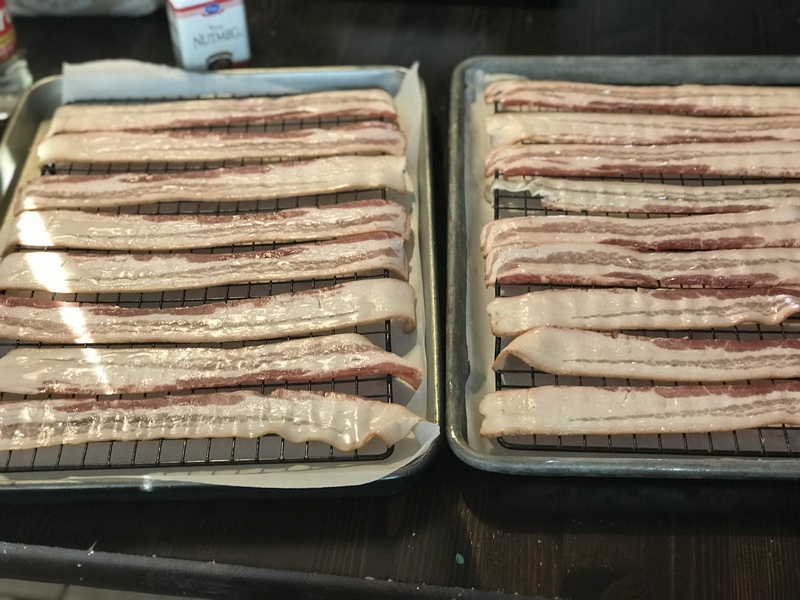 Remove each piece of bacon from the cooking sheet and place it on another cooling rack. It may be difficult to get each piece as a whole but if you break a few, who cares. Those are test pieces. 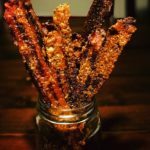 Once your bacon is cooled completely, you can arrange it (carefully) how you would like or just dig in and enjoy. Remember that little secret I told you about earlier? Well, go take a look at your parchment paper on your cookie sheet. Yep, it’s delicious brown sugar that has been caramelized in some bacon grease. Don’t feel bad about yourself one bit for snitching some of it. Preheat Smoker or Oven to 350 degrees F.